When in Manila, there can never be too many food parks. There’s really just something about food parks that makes you want to try every single one of them. Maybe it’s the festive feel of having a lot of food choices right within your reach. Or maybe it’s the chill ambiance of the open-air parks that makes eating all those scrumptious dishes a lot more enjoyable. There’s a lot of things to enjoy in food parks, so imagine the joy every time a new one opens up! Savour Manila adds to the list of our must-try food parks! 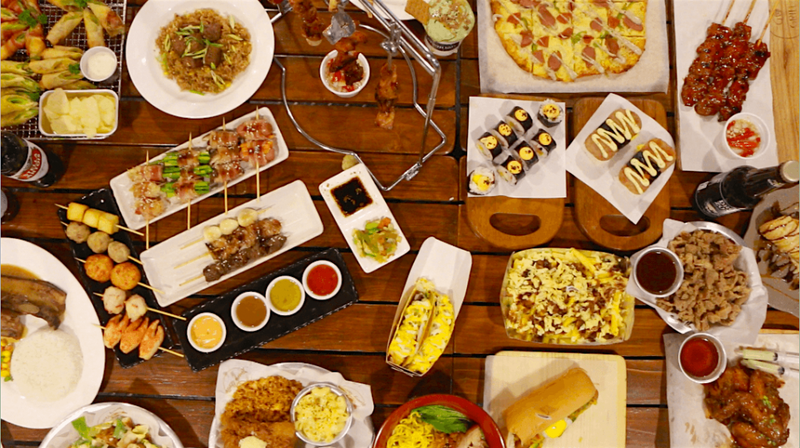 Savour Manila, located in Tomas Morato (yes, the go-to place of barkada hangouts), will take your taste buds on a glorious adventure of all kinds of food. One of the best things about Savour Manila is that its name is the perfect way to describe it. The food stalls that are housed in this food park are so diverse–there’s probably a food stall that can satisfy any type of craving! For those of you who want full meals, there are choices of American (hotdogs, fried chicken, fries, burgers), Japanese (ramen, sushi, yakitori), Mexican (tacos, nachos, rice meals), and our favorite Filipino rice meals, of course. You can basically go around the world with the food stalls available. If you’re up for just a bit of a snack, there are also our favorite Pinoy street food made a lot tastier–and more Instagrammable for all you millennials out there. So yes, there’s isaw, dynamite, and different types of pulutan. And of course, what’s a food park without the cool desserts? Savour Manila offers churros, Martabak (a Javanese dish), ice cream, waffles, and smores. Basically, you can go around the world with just a visit to Savour Manila! 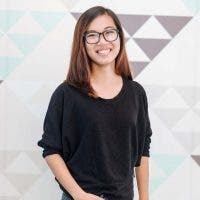 They describe themselves as a “gastronomic escape at the heart of QC.” And with the wide range of food available in this food park, it proves true. If you’re looking for a food park that will surely satisfy your cravings, Savour Manila is the place to be. Grab your barkada and schedule your trip to Savour Manila! 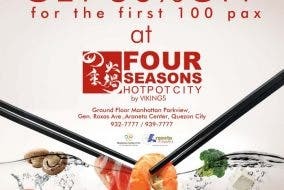 Four Seasons Buffet & Hotpot -Cubao Gives Out 50% OFF to its First 100 Diners! Korean Restaurants With Unlimited Meats!